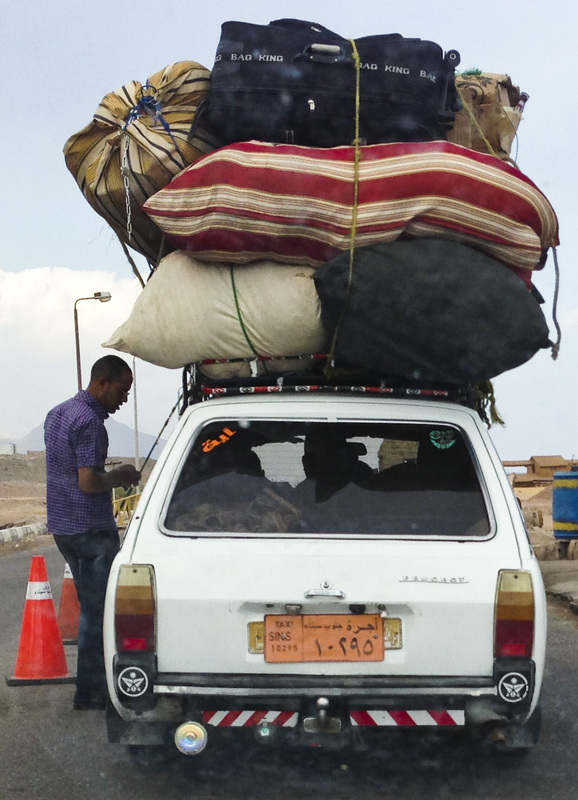 Fact: public transport in the Middle East is notoriously unreliable. Fact: the only way to get directly from Egypt to Jordan is by ferry across the Red Sea. Fact: the alternative route crosses overland through Israel. Fiction: Nothing could possibly go wrong! The ferry from Egypt to Jordan leaves from the port town of Nuweiba. When we arrived, it was crowded and smelled like a slaughterhouse. You can’t buy ferry tickets in advance – you have to just rock up and hope. Thankfully, our driver knew where the ticket office was – it’s a small, relatively nondescript building, where you can purchase tickets from a small, relatively nondescript man through a small, relatively nondescript window. With a faint smirk, the ticket man informed us that the ferry wasn’t running that day. Or that night. There was a strike of some sort. Apparently the terminal was full of thousands of stranded passengers, and it’d be at least three days before anyone could get to Jordan. At that moment, Paul spied the logo of a familiar tour company out the corner of his eye, and ran over to beg for help. The guide was friendly and accommodating – happy to share his information in order to help us work out the best alternative route to Aqaba. After about two hours in a greasy diner that appeared not to serve any kind of food at all, he informed us that his group would be heading overland, and advised us to attempt the same. It would require three taxis in three countries, and two Middle Eastern border crossings. The risk of something going wrong was high, but it was certainly the cheapest option – and if all went to plan it could even turn out to have been a better option than the ferry. He bargained us a great price for a taxi to the Egyptian border and then wished us luck and returned to his bus to drive the tour group. Relieved to be on our way, we hopped into the car of a young guy wearing long white robes. The seat covers were three dimensional Minnie Mouse heads, with her nose perfectly positioned to make your own head, resting against it, as uncomfortable as possible. Shortly into the journey north, we passed a small river that appeared to run across the road permanently. Just past it was a pile of burning tyres, and a main with one eye wearing a loincloth and covered head-to-toe in mud. A familiar sound rang in my ears – the default Nokia ringtone from the early noughties. Our driver answered his phone with one hand, and continued hurtling down the centreline by positioning his other hand on the horn. Good times. 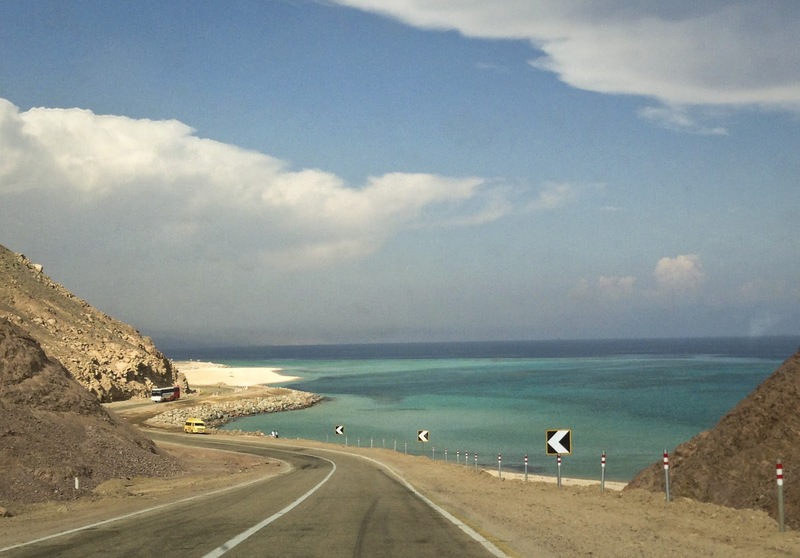 The coral reefs of the Red Sea make the whole drive rather pleasant! Our driver was a calm, middle-aged man wearing a jewish Kippah on the back of his head. He spoke perfect English and his late-model BMW had a screen in the dashboard with a camera to help him reverse. 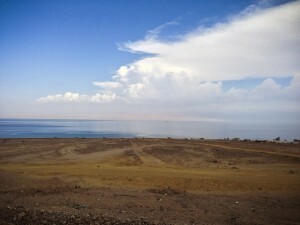 I found myself experiencing reverse culture-shock from the stark contrast with Egypt! The driving is calm compared with Egypt, but Jordan clearly doesn’t experience the same level of foreign investment as Israel, judging from the state of the roads. At precisely 7pm, our driver pulled over, removed a small mat from the glovebox, walked to the front of the car and kneeled facing Mecca (a direction even I could have established because we were so close to Saudi Arabia). After around five minutes of prayer, he returned to the car and wordlessly continued driving us to our destination. We pulled up behind these guys somewhere on the Sinai Peninsula. Relieved that our border crossings had been non-eventful, we arrived in Aqaba at around the same time as we would have if we’d been able to take the ferry in the first place. And it had actually cost less! Reflecting on our unexpected visit to Israel, I realised that the day’s events had inadvertently overshot my goal of visiting 40 countries before I’m 30! So thank you, Israel, for being my 40th. Normally I wouldn’t count a visit so short – but seeing as I’ll be back in a few days to see more of the country, I’ll let it slide this time.